For a number of years, Lena, who has a PhD in social sciences was a passionately engaged member of the Fertile Heart community. Her comments on the blogs were eloquent validations of the inner work we do in the ongoing Visionary circles. Now a happy mom of a little girl, Lena came a long, long way from the tormented young woman that first reached out to me after reading Inconceivable. Through the Fertile Heart circles and a workshop Lena met Ariana (also not her real name) and they became close friends. I wish I did, but I can’t possibly remember each of the, at this point, thousands of women who’d attended my workshops. But I actually distinctly recall the very first time Ariana spoke in the session I taught on the West Coast. I was standing at the center of the group clarifying an idea of the practice, she stood at a 2:00 O’clock angle from me. I remember her because I sensed how fully, how genuinely she was engaged with me in that moment. At some point after the workshop, Ariana joined the Visionary Circles for a while but soon after was diagnosed with cancer and I didn’t hear from her. It turns out that eventually the cancer went into remission. Her oncologist and Reproductive Endocrinologist felt it was safe for her to resume fertility treatment. Tragically when Ariana was 28 weeks pregnant, a recurring tumor required surgery and treatment. So with the baby in her womb, Ariana went through surgery and the necessary treatment. That note I got from Lena several weeks ago? She was letting me know that Ariana passed away. Dear friends, we MUST find the words. We must find the words to tell our stories; we must find the words to speak up for what we have witnessed. It’s our moral obligation to do so. My sweet friends, Ariana’s story is my guidance too. I understand that on other public forums most of you will not engage in conversation with me, to protect your privacy. For the brief period of time, before you get too busy with your beloved babies, we have a small window of opportunity to engage with each other and elevate the conversation around a hugely important subject. So let’s engage. Here and on the calls. Actively. Come to the calls with something YOU want to work on. Engage with at least one aspect of the practice, and bring in the stuff that comes up as a result. It’s the only way we get to heal. By engaging with ourselves and each other. I, too, want to keep growing braver, to honor the memory of a beautiful young mother whose path crossed mine, and honor the many women I didn’t have a chance to meet. Can we talk about what it is that keeps us silent? Keeps you silent? What would make it easier for all of us to find the courage to speak about what ails us and then find the courage to respond to each other with compassion and gentleness? I’m a little late to commenting on this post. I am consistently inspired by you, Julia, for your incredible vision and conviction. I am so grateful to have been steeped in your (and the group’s) guidance; I am noticing changes in myself that feel refreshing, grounding, and hopeful. The world of “infertility”, with its ridiculous language, unhealthy doctors, etc. etc., pales in contrast to the strength that this work, this worldview brings to me. Thank you to all the women who have shared so openly in the past few weeks. I wasn’t one of them recently, although I feel I have been in the past. Sometimes I have held back from sharing because I don’t like the feeling of getting down the “wrong” path. I want to find the kernel that needs to be aired– and I don’t mind doing it in this group– but I sometimes feel like I’m groping for this kernel (and I know there’s more than one!) . So that sometimes sounds like me talking a bit too much, and because I am such an introvert, and really an internal processor, I maybe sound like I’m in my head and not dropping in, but that’s not my experience. I’m actually just trying to find the spoken words to express a feeling, and it takes some time. I don’t know if this makes sense, but I wanted to try to share this, because it is something that holds me back in groups. On a personal level, it has been an exciting few months. I did get pregnant in the summer, and it ended in September, but I had already been actively looking into DE and adoption when I got pregnant. So I was eager to resume my excitement this fall, and moved forward with a determination that has made me not recognize myself:) I grieved the pregnancy, but it was different from past miscarriages. I allowed myself to grieve HARD, and all of this ongoing blame/regret/shame that tends to snuggle into everything I do, I noticed one day, that it wasn’t really there in the same dominating way. I kept almost looking over my shoulder, kind of in disbelief, like am I really moving with this current and I feel some new sense of freedom– a lightness even ??!! I feel really anchored in what I want– which is to live a life of wonder, ease (as opposed to struggle) and CO-CREATING, rather than as a victim. I think I can cautiously say that something real is flowing inside me, even though i didn’t believe it at first. I am happy to attempt to share this on the call. Still there are orphans, and there are some big issues in my relationship, and I know it will require more of me, and that it’s not a straight line to my next child. But I feel quite strengthened by my journey so far. Was anyone at the Resolve conference outside Boston? I went with my husband and found it fascinating in so many ways! Phew. Dear All. Thank you for this forum and the circle that we have. Gravid Sans Doute, thank you for cheering each of us on always. Dear BlueFlower, you are an inspiration and your story gives hope to others. Thank you for continuing to engage with us here. What keeps me silent? The story from this blog post is very sad indeed. And it is one among many others. For me, shame is a big factor. I have been opening up slowly but surely about my journey as i am walking it. My husband does not like me to share this with others, or on social media. So I share what feels safe to me. For example, with some coworkers who may open up to me, who have walked on this path themselves, or considering the ART. I wish I could tell my younger self (3 years back) that ivf is not a short cut to our babies. It can be as much a long winded road as any other. It was probably the Shame O that stopped me from even registering for the new V series after we restarted after a short interval – during which our frozen embryo transfer failed. As I look back on the month of August, my Visionary notices, what was I thinking, when I said yes to the transfer in the midst of a whole bunch of activity (family visiting us) and travel and going for hysteroscopy a day before the travel. The vacation that I looked forward to for four months, it was only 4 days long. But due to the hysteroscopy I could not get into the water, nor practice swimming. My motivation for learning to swim came from this vacation, and a day before this vacation I go for a surgery that cautions me from getting into the water. In my wildest dreams, I would not think I would betray myself this way, but in the reality of my life, this has happened. I feel very bad and very guilty for timing things this way. Not to mention the discomfort that came with the progesterone supplementation. I do applaud myself for continuing to prod further, and then realizing in a conversation with the doctor, that i maybe allergic to iodine, and he did not use iodine for the hysteroscopy. Well, this is the burden I wanted off my chest. And this is where I need to acknowledge what went wrong, and how I need to be present and also forgive myself. The panic can get to any of us. It is also a realization, that the co-pilot with whom I share this journey may not always have my best interest in mind – his goal is to get to a baby that’s biologically ours, but I may not rely on him for safeguarding my body in this process – this is entirely my responsibility, and I need to claim my power in doing so, I have the tools to stand up for myself. I look forward to receiving more guidance through the intro series for which I just registered. Thank you dear Julia for being present for all of us. I know I would have quite lost myself without your guidance. Dear Julia, Thank you for your post and I am very sorry to read about Ariana. I have read your blog a few times now and never sat down to write out my thoughts and feelings about this, as the ‘cancer’ word gives me so much fear I often freeze when I hear it. My beautiful sister-in-law went through hell with it (as did her mother and sister), as have three of my grandparents, as has my father. In fact, my fertility journey and my FH practice has made me realise that it is also part of my journey to heal my Orphan that is afraid of talking and reading about cancer. Strangely, this is the first time (or at least it feels that way) when I have admitted this to myself. I can talk about cancer in the abstract but not in relation to me (until recently). I remember you saying to me on one of our calls that “you are not your parents or your grandparents” and that gives me a lot of strength and I am healing that O now and given I can even write this means to me that that O is starting to heal. 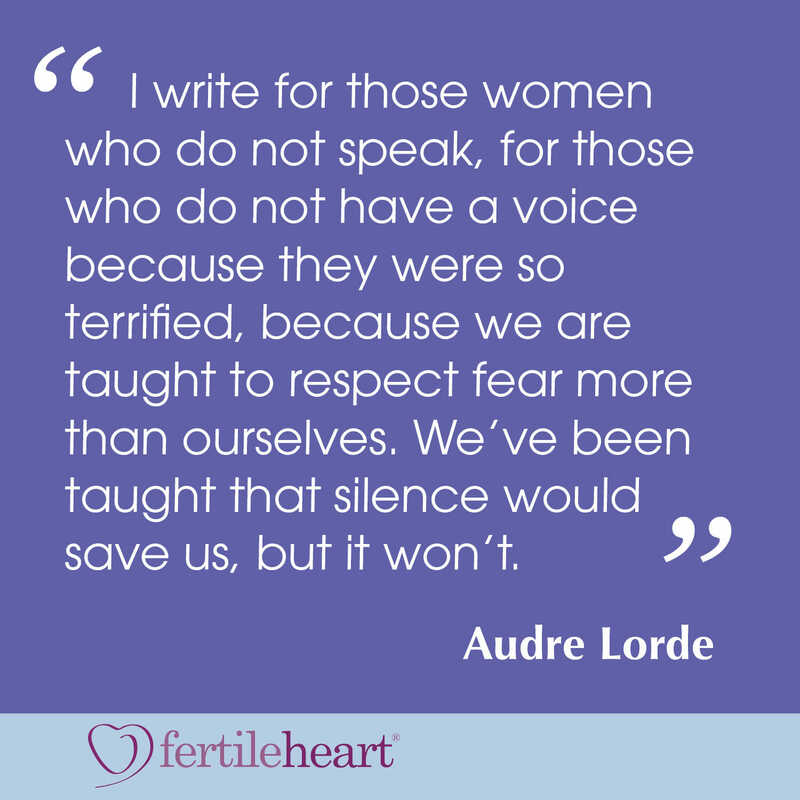 However, when it comes to me talking about infertility, I still keep myself silenced. One of the reasons is that I judge myself and often blame myself for being unable to have a second baby for these past 6 years. 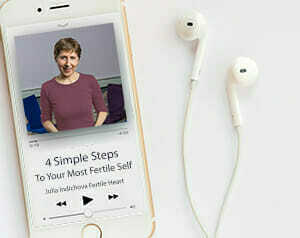 I am ashamed that I work too much and do not get to bed early (though I am now working on that) and I am afraid if I talk about my fertility journey, that I will be opening myself up to many more tactless comments and advice (I get many of those on a monthly basis) and that someone with the knowledge of my fertility challenges will use it against me to cause me more pain than I can take. I get so embarrassed and freeze when people ask me if I am pregnant (as sometimes I do get pregnant but in the past two instances it did not last long) – and I have to say “no I am just fat” or “no my tummy is just that way”. Rather than saying ‘I wish you had not said that as your question cut me in my heart, because I was pregnant but it did not work out’. I am not sure how to get to a point when I am ok or able to say that in the ‘heat of the moment’. In the spirit of our last call, I have been doing good things for my body: resting more during the day, gentle yoga, I went for a walk when I felt like it, just knitted my scarf and watched something on tv (instead of forcing myself to work when I hadn’t slept for the past 4 days due to my daughter getting up every night). I am even going to book a massage for next week… not done it yet – it would be the ultimate indulgence which I have not done in years. Peace and love to you all dear Visionary Moms – I have missed you all so much – I have been absent for quite some time, taking a breather and now I feel I am back to start a new direction on my journey where I have more courage and faith in my path. I love your name! Congratulations on naming your fear of talking and reading about cancer.I’m sorry your family has suffered with it so much. I’m happy for you that you are doing more and more things for yourself! , through a dream about a raging fire, that I had a really strong orphan that was so angry at my husband. When I looked closer, however, I could see my anger was coming from an orphan from my childhood and a memory I had of lying on my bed crying, angry at my brother for teasing me and angry at my dad for humiliating my brother. So, in essence, I was transferring my orphans anger against my dad and my brother, onto my husband. Just admitting that feels freeing. I feel pressure to present as having. A conflict free marriage, with few issues. When in fact, my husband and I have experienced two significant traumas which has put our marriage under a lot of stress and forced us to deal with the cracks in our relationship. Yes, I am not perfect and I don’t have the perfect marriage. It feels as though the topic is so taboo. My most recent dream was last night when I dreamt that I was at my health clinic and a nurse came in and told me I was pregnant. She told me with such joy and confidence. She said you have a very healthy vibrant preganancy. Upon hearing the news I burst into tears. They were tears of joy and tears of catharsis. In the dream I kept saying over and over again “i wanted this for so long! Oh my God I have wanted and longed for this for so long. Oh my god! I wanted this so so so much and it was so hard to wait so long!” I was shocked and elated and out of my mind with the news and I cried and cried and cried. Thanks very much and I love your name, too! For me KeepingFaith is all about attaining freedom from my fears. Looking my fears orphans directly in the eye is quite a challenge at the moment..
Sending you lots of good energy and happy dreams!! I’m sorry to hear of Ariana’s passing. And what a pertinent question you ask Julia! What keeps me silent is the orphan within that tells me that I don’t belong anywhere and that I keep miscarrying because I’m not a ‘good enough’ mother to my three year old daughter, and that no soul wants to stay with me now. Shame of judgement and fear that this is my fault (I’ve left it too late, I should’ve tried medical intervention by now) keeps me silent and prevents me from connecting with others. And fear of my own grief over-spilling, as if my silence plugs my tears. Your exercises help me to identify this voice as an orphan, but it still feels overwhelming at times. BlueFlower, congratulations on your wonderful pregnancy and being fit and strong! HeartDot, that is wonderful to notice the gifts from strangers. Freedom, I am glad the words were healing and wonderful dream.WithGratitude, I will pray for your healing. AnchorMama, thank you for your words of encouragement. I am continuing to work with Welcome Home Fertile Heart Body Truth and the imagery related to doubt. I am continuing to try to focus more on nurturing myself and less on concerns related to work. I was deeply moved by this post, not least for having been through my own experience of cancer, and for reading it at around the same time in my own pregnancy when Ariana was sadly re-diagnosed. Julia, I agree, we must speak, we must find the words. And yet it is not easy to do so (and I am even writing this post under a different name to the one I was previously using so I can be totally open, yet remain more anonymous…). I was silent to all but closest friends and family about having had cancer for many, many years . But quite recently, I finally opened up, and now I don’t care who knows, and I am so glad I did this. It feels as if a burden has been shed. I now have no shame about what I went through (the initial secrecy was, in fact, less about shame and more about wanting to protect myself from other people thinking stuff like ‘Is she going to die, then?’ or making tactless comments – that said, had this happened today, I think I would have been more open from the start) and I’m actually proud of who I am today, in spite of (or perhaps because of?) this experience. I think we must speak not only to stop the shame, but also to educate and inform those who haven’t been through these experiences so they can understand them better and have greater compassion. And we must speak to support those who have been through them so they don’t feel so alone, and so the taboos around things such as illness or ‘infertility’ are removed. We must speak to show the truth of life, which is that all sorts of s**t happens and the truth is it’s far messier than the picture perfect reality too many of us are pretending we have, which social media tends to only propagate. But being completely open about my fertility journey has proved harder. Maybe one day I’ll be able to, but not right now. I have no problem telling people that it took us a good few years to get here and that we eventually conceived via IVF. But I don’t find myself able to tell the full story, which is that we used a donor egg. I am afraid people wouldn’t understand why anyone would do that, that they would think the child wasn’t really ‘mine’ – even my own mother made a tactless comment with regards to this not so long ago. And I know that when donor eggs were first suggested to me, I thought, oh no, I don’t want to do that, it wouldn’t be mine, how weird is that. Yet the truth is this baby now kicking inside me feels so totally mine. Maybe I am still waiting to see if that feeling is there when the baby arrives. Maybe there will be a day when, like with the cancer, I couldn’t care who knows. But right now is not my time. The other orphan I have, is that I don’t like to broadcast is my age. I don’t want people thinking, oh she’s too old etc. And yet I know I am fit and strong, I know that to date (and I’m now 3/4 way through my pregnancy) I have had a textbook and very easy pregnancy with none of the risk factors associated with pregnancy in later life. And that despite using a donated egg and doing this later in life, it feels right. Thank you, Julia, as always for your words. I’m not currently part of the circles but I always do love to read what you write. Dear BlueFlower! It’s so great to hear from you, and your input on this subject is so very very valuable to hear. You’re someone who has always honored her own truth and I’m which is what our practice is all about: discovering what our truth is and then honoring it. I’m so thrilled about that lucky baby in your belly. Thank you for checking in here and for sharing your thoughts/feelings so openly with all of us. I felt an instant connection reading your blog. I can’t agree enough with you that WE MUST FIND WORDS to tell our stories. Fertileheart practice healed so many orphan babies of mine be it guilt, shame and broke so many taboos, gave me the strength to travel into the unknown, discover myself, embrace my fertility journey and helped me to open up my heart to motherhood, no matter what path I chose. Initially I hesitated to like FH page on facebook or add a comment and sharing a page or blog was out of equation. But thankfully I worked through my fear orphan and now I feel so proud of my journey. I openly tell people for how many yrs we TTC and that I have taken the IVF route except for one piece of information. I can fully connect with your feelings related to going donor route. Though there was a bit of fear initially but the moment the baby fell into my hands all my fear was out of the window. I can’t thank the women who donated her tissue and I can’t thank GOD enough for the beautiful baby he has bestowed upon us. I am just head over heels in love with the baby. Though I and my husband have made up our mind that we will never ever share this specific part of our journey with anyone (except handful of people in my life), this decision is not orphan rooted (shame or guilt). But it is based on our experience that our own parents, kith and kin and friends don’t understand our decision and can easily make senseless comments hurting the harmony of our lives. I felt I don’t need to convince or answer or please anyone WHY we took this decision. I wanted to be a mother, my body gave me permission to go this route, and I have my baby now. This was not an easy decision and I worked relentlessly for 3yrs before I and every cell in my body wholeheartedly embraced this path. Except folks who ardently practice Fertileheart OVUM tools, no one can understand what these statements mean. So why propagate this to everyone and then start fighting the unnecessary battles is what I thought and chose not to open the discussion. I have handpicked few people in my life, who knew about this before we went on this journey and were fully supportive. I wish you the best in your pregnancy. Enjoy every moment of this journey. Thank you so much for your words – they mean a lot, especially hearing how in love you are with your baby. Most of me trusts that the same will happen to me, though there’s still a tiny bit of fear that what if it doesn’t. So your words are very reassuring. And it sounds like we are indeed in similar places with regards to why we are not sharing this with the whole world. A few days ago I met a friend who told me about one of her friends who was having a baby using a donor egg. My friend described her as “having made the ultimate sacrifice” and I just wanted to go no, it’s so not that – it’s actually the ultimate gift, but of course I couldn’t as she doesn’t know about me. So it’s for precisely those kinds of reasons I keep the full story to myself. My only regret about this is that I get other women in their 40s coming to me and saying I give them so much hope – and I know what they mean is hope about conceiving with their own eggs. I often think staying silent just makes things easier. I’m not one to look for pity or the I’m sorries. That being said, I hang on to strangers kind gestures, compliments or small conversations that provide me the hope when I least expect it. I’m so grateful that you spoke here, C., thank you for that. I, too, choose silence at times, usually, when a particular topic evokes a strong Orphan-rooted response. In which case I know I must soothe her enough before I speak. But then comes a time when what I see around me hurts too much to remain silent. Thank you again, your reply means a lot to me, knowing that speaking up is not easy for you. Thank you, Julia! Thank you, Anchor Mama! Thank you for your words, Gravid San Doute! Your compassion is healing for me. Wow. To read your response, “I’m sorry you’re having challenges conceiving” or “I’m sorry you had such challenges with the birth of your first child” was medicine for me. What stands out to me about my shame and judgment is that they are over things I can’t control. Why is that my response? Love it!! Love that dream…truly a gift for us all! Looks like we’ll have some great love letters from the UM to read at our next circle. I am so scared, I am so sad, I am so tired, I am so frustrated, and I am so angry. Will it ever be my turn? We were prepping for what is probably our last embryo transfer. I haven’t had time to keep up with my routine doctor’s appointments with all this fertility business and lately I’ve been running around checking all of them off my list. Last Thursday I ran from my reproductive appointment to my mammogram. Yesterday, just as I was documenting the new instructions for my fertility protocol this month (and sitting in a long afternoon class), I found out I need a biopsy based on the mammogram results. Just like that, all the prep we did for this transfer is for naught. I have to stop the medications. I certainly hope it’s nothing serious and I know it needs to be checked out before a transfer. But why now? Why do I continue to come so close and have the rug pulled out from under me? My orphan is screaming and crying. I don’t speak out loud to everyone. I have a select few in my circle I confide in. It’s not for everyone. But it’s for this group. Thank you Julia for giving us the space to let it out. I know it’s helpful for healing. My God I hope it’s helpful for my healing. I really need it. Sending much much love to all the beautiful Orphans that need tenderness and space for their truth as they walk to the other side of this particular rickety bridge of fear and frustration. And hope to hear your voice on the call next week. Such a beautiful beautiful post. Thank you Julia. For me, the thing that keeps me silent is fear. Fear of what the other person might think. Fear of being judged. Fear of being wrong. Fear that I may upset someone else. Fear is a strong orphan of mine that has many many layers, each with its own beautiful aspects. As I learn to love myself more deeply and be more compassionate with myself, I am healing. The concept of a gentle and compassionate world feels so hopeful to me. I try to live each and every day in the most kind, compassionate, gentle and loving way I can. What I have to be careful of is that I am far better at all of those things when they’re directed toward someone else, rather than inward toward myself. My practice keeps healing me and in essence is helping me to spread more love and healing everywhere I go. This practice has taught me not only how important my voice is, but also how to hear it and use it. It isn’t always easy, but through the support here, I find the courage to keep listening, keep talking, keep searching. All my love to you all. May you find your voice and use it. I for one love to “hear” it. Each voice is always an inspiration. I’ve never “met”/heard one voice that didn’t inspire me in some way. I think we all may be braver and stronger than we realize. All my love back to you, D., so good to hear your voice growing stronger, clearer, braver and more and more beautiful! Thank you for this blog, Julia. I am sorry to hear of Ariana’s passing. There are many ways of making babies currently being used that may not be healthy for us. The beauty of the Fertile Heart work is the healing that it encourages – that life can be amazing, a time of discovery, with or without a child and that a child is possible if the longing is there because for most women there are many avenues to creating a family. Freedom, I understand about shame being part of this circumstance. Perhaps that means there is someone saying “you should be ashamed of yourself because…” Maybe now it is in our heads. There is a lot of judging in the world and since none of us are perfect, we can’t win in the trying to be perfect game.Then we need to see who is the one judging and do they have the authority to judge us? Are any of the rest of us imperfect humans in a position to be able to judge? Of course not. I have been working with Welcome Home Fertile Heart Body Truth and the 2 frames imagery about doubt. I am still trying to remember to breathe and do something nurturing for myself every day. Thank you, R. for your, so consistently compassionate responses to all of us, I’m so grateful for your presence in our community. Thank you for this beautiful post, Julia. Your question at the end is my favorite part. Can we talk about what it is that keeps us silent? What keeps me silent is shame. Specifically shame about my body. I am ashamed that I am struggling with infertility. I am ashamed that my body hemorrhaged with the birth of our first child and I have been unable to conceive for the past 4 years. I am ashamed of my age and that I am brazen enough to think I can try to get pregnant now. When I close my eyes and listen to this orphan that is so filled with shame I cry and I see an image of my brother flash across my mind This shame is so deeply familiar, almost like soft flannel sheets from my childhood. This shame has texture, smells, and images. This shame is my lineage. I tell them my FSH is great. I tell them things on the inside are working great. I go in and out of feeling hopeful. I do the imagery exercises religiously. My dreams have chapters. They are in technicolor. They seem endless. I write it all down. And they keep coming. I’m with you, S., our shame does come with “texture, smells, images.” To be replaces through our practice with alternate texture, smells and images. Look forward to working on some of those dreams together next week. Thank you!